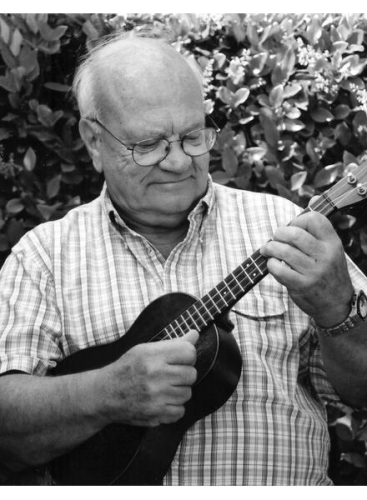 Lyle Ritz, 87, Los Angeles studio bassist and ukulele legend, a resident of Portland, died peacefully, March 3, 2017. He was best known as an acoustic bass player for the legendary Los Angeles studio group, the Wrecking Crew. He was also known for his groundbreaking recordings and passion for a much smaller instrument, the ukulele. Lyle is survived by his wife of 40 years, Geri Ritz; his daughter, Emily Ritz Miyasato; and adoptive son, Thomas Ritz. Thomas Ritz has two daughters, Lauren and Jenna Ritz. Lyle was predeceased by his beloved son-in-law, Jared Miyasato. This entry was posted in All News, Final Notes / In Memoriam and tagged final note, Final Notes, Lyle Ritz on April 4, 2017 by admin.